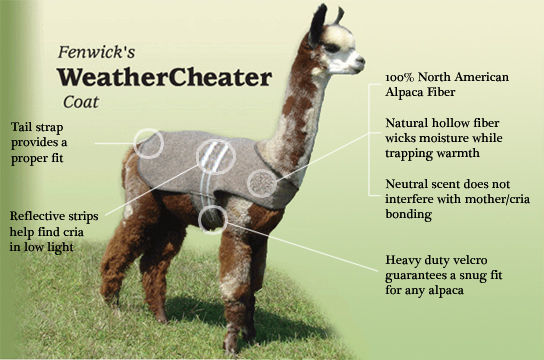 Fiber Pricing :: Fenwick WeatherCheater - Adult - 30"
Home/Fiber Pricing/Fenwick WeatherCheater - Adult - 30"
Fenwick WeatherCheater - Adult - 30"
Fenwick's Weather Cheater coat is made in the USA with 100% North American alpaca fiber. It has been carefully designed to mimic the benefits of an alpaca's own fleece & will protect against cold, wind and severe weather for many seasons. The natural fiber allows the skin to "breathe", reducing sweating and easing temperature fluctuation. Enlarge image for more information.